Heavy alcohol users who quit drinking often find themselves faced with withdrawal symptoms that can range in intensity and severity.1 Alcohol withdrawal can pose serious health risks that in some cases may be fatal. It is highly recommended that alcohol users undergo medically supervised detox because of this risk of life-threatening withdrawal symptoms. The length of alcohol detox can vary, but the most serious symptoms often resolve within a week. Alcohol withdrawal can cause a range of physical and emotional symptoms. Alcohol detox programs closely monitor withdrawal symptoms, prescribe medications to mitigate seizure risks and otherwise ensure that detox is completed safely and comfortably. Transitioning to a treatment program after detox helps address the root causes of addiction. Who Answers? to find detox and treatment programs for alcoholism and find out what your insurance will cover. Detox is the process of eliminating alcohol from the body. Within a remarkably short period of time after a heavy alcohol user has a last drink, his or her body may begin to experience withdrawal symptoms. These symptoms can be uncomfortable and even dangerous. Alcohol withdrawal typically begins within 6 hours to 24 hours after a person’s last drink. 1 The onset can be so sudden that alcohol may still be present in the body when the first signs of withdrawal begin to show. Symptom severity tends to peak within 24 hours to 48 hours. During this time a person’s risk of experiencing seizures and delirium tremens is high, often requiring close medical supervision. 2 In severe cases, seizures and delirium tremens can be fatal. Stage 1 begins within hours of the last drink and involves anxiety, shaking, nausea and vomiting. Stage 2 begins within 24 to 48 hours. During this stage a person experiences increased anxiety, shaking, confusion, sweating and hyperactivity. Heart rate and blood pressure also increase, and a person may experience insomnia and poor appetite. Stage 3 can involve seizures and high fever, which are cause for concern. People with a history of epilepsy are at higher risk of seizures. Stage 4 is the most dangerous stage and occurs in a small number of cases. Delirium tremens may occur and can involve significant confusion and hallucinations. These symptoms begin after 48 hours and often last for 3 to 5 days. The most severe symptoms of alcohol withdrawal occur during the first week of detox. Other symptoms, including nausea, insomnia, poor appetite, anxiety and irritability may resolve within several weeks. Alcohol withdrawal can cause both physical and mental symptoms that can range in intensity. The symptoms can pose risks to users. However, treatment programs are available to ensure a safe detox process. Delirium tremens may be fatal in severe cases. It is highly recommended that people with long-standing or more recent heavy drinking histories be monitored by a medical professional for the potential onset of these symptoms and administered appropriate seizure prophylaxis and other supportive medical intervention until the dangers have resolved. Age, physical health, mental health and liver functioning can affect withdrawal. Poor nutritional status (e.g., vitamin deficiencies, dehydration, etc.). Use of other medications, including benzodiazepines. The unpleasant symptoms that arise during a period of acute alcohol withdrawal are, in part, mediated by a disruption in the brain’s neurotransmitters following a period of heavy drinking. 2 Alcohol consumption enhances gamma-aminobutyric acid (GABA), which is responsible for feelings of relaxation, and suppresses glutamate, which is responsible for agitation. Over time, tolerance for alcohol develops, and the user needs more to achieve the same effects. When a heavy alcohol user stops drinking, various neurotransmitters in the brain (GABA, glutamate and the catecholamines) attempt to rebalance themselves. This can result in withdrawal symptoms that can range from mild to severe. 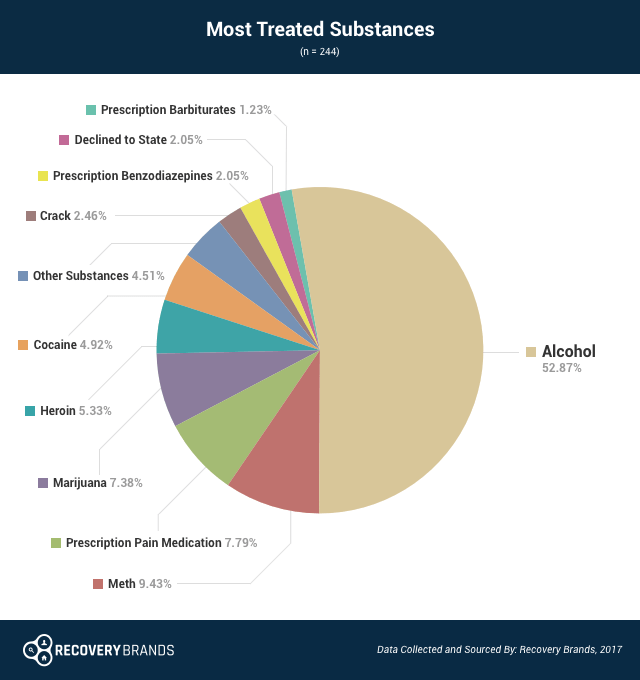 Alcohol, or ethanol, is the most commonly abused substance for treatment facilities, a 2017 survey by Recovery Brands revealed. The survey reports that nearly 70% of respondents went to treatment for an alcohol abuse problem, and a surprising 52.87% of respondents received the most treatment for alcohol abuse. Who Answers? to escape the hold of alcohol abuse and step on the path toward recovery. Some alcohol users opt to withdraw from alcohol in a detox program. Medically supervised detox programs allow the body to eliminate alcohol and ensure that withdrawal symptoms are safely monitored to prevent serious and potentially fatal consequences. Evaluate current symptoms and drinking history. Stabilize symptoms and treat any life-threatening conditions. Prepare for transition to a treatment program. While detox programs will vary somewhat in their approach, you can expect to find some similarities between programs. Intake. The detox process begins with an initial intake. This may be done over the phone or in person. The intake is an opportunity for both you and the treatment center to determine if you are a good fit. An intake counselor will ask questions about alcohol use history, medical and mental health issues, and readiness for change. You will have an opportunity to learn about the detox center’s program and ask questions. Medical monitoring. Many programs limit activities such as exercise during the first 5 to 7 days of detox. During this time, symptoms are most severe and should be closely watched and medically managed should they arise. Professional staff. Professional detoxification centers will have a team of medical and mental health professionals on hand to supervise the detox process. You may also be assigned a primary therapist and/or case manager who can offer support. Medications. Medications are often prescribed to manage withdrawal symptoms. These medications can decrease discomfort and prevent dangerous symptoms from occurring. Vitamin and nutritional therapy. Lack of appetite is a symptom of alcohol withdrawal, and it is common for people to lose weight during detox. Alcohol users are often deficient in magnesium, zinc, calcium, iron, vitamin A, vitamin E, thiamine, folate and vitamin B12. 1 Detox programs often offer nutritious foods and supplements to improve health. Peer interaction. Most programs offer opportunities for clients to spend time with one another, especially as symptoms are stabilized. Some detox centers offer 12-step or other recovery meetings in order to encourage clients to begin building a sober support network. Alcohol withdrawal prophylaxis involves preventing withdrawal symptoms from occurring altogether or controlling mild symptoms so they do not progress to severe symptoms. This is especially important for alcohol since withdrawal can lead to complications and in rare cases may be fatal. Detox centers may offer preventive medications after evaluating a person’s current condition and medical history. Benzodiazepines – including Ativan, Librium and Valium – are the treatments of choice for alcohol withdrawal and can prevent the development of serious withdrawal symptoms. After symptoms are stabilized, the dose is gradually reduced, since benzodiazepines are not recommended long-term. Barbiturates such as phenobarbital are effective for decreasing alcohol withdrawal symptoms. Barbiturates are considered to be highly addictive, however, and can result in fatal overdoses. Therefore, they are prescribed in highly supervised settings and only for a short period of time. Carbamazepine is an anticonvulsant drug that is used to treat alcohol withdrawal and prevent seizures. Its benefits include a lower risk of addiction and overdose compared to benzodiazepines and barbiturates. Beta blockers can help manage some of the symptoms of withdrawal that other drugs do not treat, including high blood pressure and rapid heart rate. Disulfiram, also known by its brand name Antabuse, is prescribed for daily use and produces an unpleasant reaction if a person uses alcohol. The anticipated negative reaction has been found to deter people from drinking. Acamprosate is approved for long-term treatment and is thought to work by restoring balance between the neurotransmitters in the brain. Naltrexone may decrease the rewarding effects of alcohol and reduces the risk of relapse. It can be administered in pill form or by injection. Who Answers? anytime to talk to a treatment support specialist about alcohol detox or recovery programs near you. When you decide that you are ready to attend an alcohol detox program, you will want to consider whether you would like to attend a stand-alone detox center or a program that combines detox and treatment. People who attend detox centers often temporarily reside at the center and receive 24-hour supervision. A disadvantage of stand-alone detox centers is that they tend to offer limited treatment services. While they can assist with detoxing from alcohol, they do not treat the roots of addiction. On the contrary, treatment programs are typically long-term and can be either inpatient or outpatient. The focus of treatment programs is to help you understand the reasons for your addiction, identify your triggers for drinking and learn new ways to manage triggers and negative emotions. An advantage of a treatment program with detox is that you can remain in the same facility. You might feel comfortable with the program, staff members and other residents. A treatment program that combines detox allows you to work through the process of recovery in one place. Outpatient may be appropriate if you’re in good health and don’t have a long history of alcohol abuse. Outpatient programs for alcohol detox are available at treatment centers and at doctor’s offices. People experiencing stages 1 and 2 of withdrawal may be appropriate candidates. Intake. They will perform an initial evaluation of your drinking and medical history in order to determine if outpatient detox is safe. Medications. Medications, including benzodiazepines, anticonvulsants and beta blockers may be prescribed to manage withdrawal symptoms. These drugs may be gradually tapered after withdrawal is complete. Barbiturates are rarely prescribed for outpatient detox because of their systemic toxicity and potential for overdose. Anti-craving medications, such as naltrexone and acamprosate, may be prescribed to reduce cravings for alcohol. Outpatient detox requires you to go to the detox center each day. If transportation is an issue, then inpatient detox may be more suitable. Outpatient detox is not recommended for people with a history of seizures and delirium tremens. These people are at higher risk for experiencing these symptoms and should be supervised in an inpatient program. People who use multiple drugs or have mental health issues, or who have a history of suicide attempts or self-harming behavior, should seek inpatient detox. People with serious medical issues, such as diabetes or high blood pressure, or who are pregnant, should also attend an inpatient program. 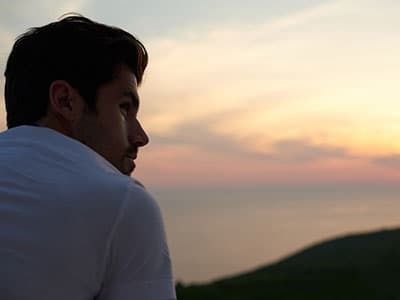 Outpatient detox may be appropriate for if you are in good physical and mental health, do not have a long history of alcohol use, and have not experienced serious withdrawal symptoms in the past. Also, it is important that you have a supportive family member or friend who can assist with monitoring symptoms and ensuring medications are taken as prescribed. Detoxing at home without supervision of a medical professional can be dangerous, especially for heavy drinkers. Detoxing naturally can pose significant risks for these users. It is highly recommended that alcohol users be evaluated by a physician prior to detoxing at home. Detox is the first step in the recovery process. Long-term recovery depends not only on detoxing from alcohol but addressing the issues that led to addiction. Research has found that most people benefit from at least 3 months of treatment in either an inpatient or an outpatient setting.7 Attending treatment after detox increases the chances of recovery. Inpatient programs, which allow you to reside at a treatment program and attend intensive therapy. Outpatient programs, which can range in duration. Partial hospitalization and intensive outpatient programs offer several hours of group and individual therapy per week. 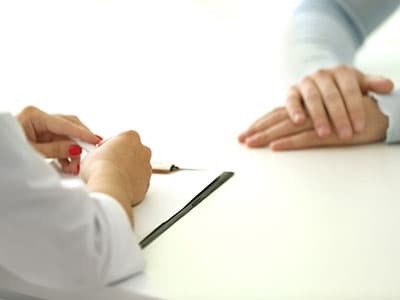 Psychotherapy involves meeting with a therapist who specializes in treating addiction, usually once per week. Support groups are free programs that offer an opportunity to connect with other sober people. 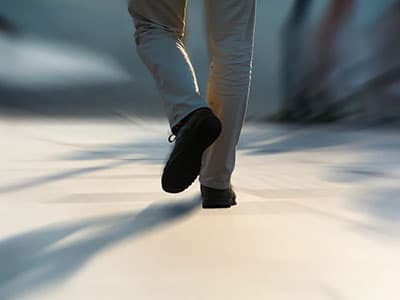 Twelve-step groups such as Alcoholics Anonymous and non-12-step groups such as SMART Recovery can be beneficial tools both during treatment and after discharge. Exercise, having a support system in place and participating in hobbies and other enjoyable activities can reduce negative emotions and stress, which can decrease the chances of relapse. 7 Also, avoiding triggers for drinking after discharge from treatment is important. Triggers may include bars, liquor stores, the alcohol aisle of the grocery store and family and friends who use alcohol. Is There an Alcohol Detox Diet? Long-term alcohol use can lead to nutritional deficiencies that can prolong or interfere with detox. 1 Alcohol can result in low levels of magnesium, thiamine, folate, zinc, iron, calcium, and vitamins A, E and B. Low levels of thiamine, also known as vitamin B1, could lead to the brain disorder Wernicke-Korsakoff syndrome if left untreated. Proper nutrition and a healthy diet of fruits, vegetables, complex carbohydrates and protein can reduce some of the negative effects of alcohol use. Low sugar and caffeine intake. While nutrition can assist with detox, it cannot replace medical detoxification. A healthy diet will not prevent or cure the dangerous side effects that can arise during alcohol withdrawal, including seizures and delirium tremens. Are There Any Risks Associated with Rapid Alcohol Detox? Some users are attracted to the idea of a quick and painless withdrawal. However, studies on rapid opiate detox have found that contrary to claims, rapid detox is neither painless nor safe.9 Risks are especially high for people with preexisting conditions, including diabetes, bipolar disorder, hepatitis, heart disease, HIV/AIDS and a history of pneumonia. Further, rapid detox does not increase the likelihood of long-term recovery. Are There Any Health Conditions That Could Be Affected by Alcohol Detox? Alcohol detox may pose higher risks for people with pre-existing health conditions or those who are taking certain prescription and over-the-counter drugs. 1 Benzodiazepines, barbiturates, antibiotics, anticoagulants, aspirin and acetaminophen are some medications that may lead to adverse effects. An assessment by a medical professional can be used to screen for any drugs and conditions that pose a risk for detox. Gastrointestinal disorders, including reflux esophagitis, which can be triggered by alcohol’s effects on the esophagus and cause severe heartburn, indigestion and bleeding. Gastritis is also a cause for concern because alcohol increases the secretion of acids, which can cause inflammation and bleeding. Pancreatitis is strongly linked to heavy alcohol use. Symptoms can include abdominal pain, fever, nausea and vomiting. If left untreated, it may progress to a chronic condition. Liver disease and cirrhosis pose risks during detox due to increased nausea, vomiting and electrolyte imbalances. Cardiovascular disorders that pose risk include hypertension, heart disease and cardiomyopathy. Symptoms of chest pain, rapid heart rate and high blood pressure are common during alcohol withdrawal and may be exacerbated by these conditions. Anemia involves low levels of folate, iron and vitamin B, which may result in neurological complications, increased fatigue, elevated heart rate and shortness of breath during detox. Wernicke-Korsakoff syndrome is related to thiamine deficiency secondary to heavy alcohol use. The disease requires special consideration during detox. If you are considering alcohol detox and treatment, call our helpline at 1-888-319-2606 Who Answers? for assistance finding a treatment center and verifying insurance coverage. If you do not currently have insurance, please call SAMHSA’s National Helpline at 1-800-662-HELP (4357) for assistance finding an affordable treatment program.
. Center for Substance Abuse Treatment. (2015). Detoxification and substance abuse treatment. Treatment Improvement Protocol (TIP) Series, No. 45. HHS Publication No. (SMA) 15-4131. Rockville, MD: Substance Abuse and Mental Health Services Administration.
. Carlson, R. W., Kumar, N. N., Wong-Mckinstry, E., Ayyagari, S., Puri, N., Jackson, F. K., & Shashikumar, S. (2012). Alcohol withdrawal syndrome. Critical Care Clinics, 28(4), 549-585.
. World Health Organization. (2012). Management of alcohol withdrawal.
. Ungur, L. A., Neuner, B., John, S., Wernecke, K., & Spies, C. (2013). Prevention and therapy of alcohol withdrawal on intensive care units: Systematic review of controlled trials. Alcoholism: Clinical and Experimental Research, 37(4), 675-686.
. Jung, Y. C., & Namkoong, K. (2006). Pharmacotherapy for alcohol dependence: Anticraving medications for relapse prevention. Yonsei Medical Journal, 47(2), 167-178.
. National Institute on Drug Abuse. (2012). Principles of drug addiction treatment: A research-based guide. NIH Publication Number 12-4180.
. Blondell, R. D. (2005). Ambulatory detoxification of patients with alcohol dependence. American Family Physician, 71(3), 495-502.
. National Institute on Drug Abuse. (2006). Study finds withdrawal no easier with ultrarapid opiate detox.